If you haven't read the Night Angel series yet, you've no doubt seen the covers. Upon release and for a long while after these three novels were on shelves EVERYWHERE! From Borders (RIP) and Dymocks to Target and K-Mart if you looked on a book shelf, it was there. 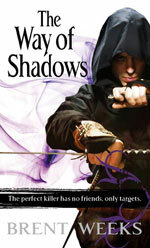 His latest series is the Lightbringer trilogy and it tells a story that is almost impossible to put into words. Thankfully, Mr Weeks manages to do so. The universe of Chromeria, colour magic, Blackguards and Prisms takes us to a world that is fresh and exciting while still managing to give everything a well established, lived in feeling. 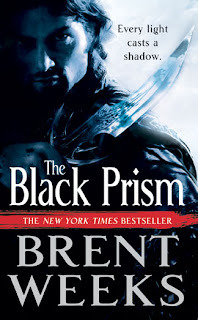 Book One, The Black Prism, is the most absorbing book that I have read in the last few years and will soon be followed up by Book Two, The Blinding Knife. Mr. Weeks was kind enough to spare some time and have a chat to us here at The Geek of Oz. 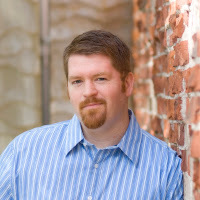 Ryan: Today I have the pleasure of speaking to Mr Brent Weeks, author of the incredibly popular Night Angel trilogy and the Lightbringer series. Thanks for taking the time to speak with us. Mr Weeks: Thank you, Ryan. I really appreciate the chance to sit down at my keyboard and pound out a few words! Wait... Seriously, though, I really appreciate having the chance to snag maybe a few new readers and answer questions for fans. You've just put the finishing touches on volume 2 of the Lightbringer series, where do Guile and co start off? And how long can us punters expect to wait before getting our hands on it? The publication date is going to be in very early September. It's ultimately up to my publishers, but it looks like we're on track to make that happen. Publishing is a slow business, and though there are a few exceptions of fantasy writers like George R.R. Martin who finish a book and are published within three months, usually it's a 9-12 month process. Or even longer, sadly. You've set up your own world in the Lightbringer series with Prisms and Colours etc. Is it difficult to create a detailed background without it becoming slow and laborious? I think actually that that's the primary challenge of having a magic-intensive world like this one. Fantasy books already have a ton of exposition required. That is, explaining the politics, history, mythology, theology, sociology, and cosmology of another world, while trying to keep telling a story. When you add on top of that a wonderfully detailed magic system, the whole structure can get a little heavy. So trying to maintain a nimble storytelling style and a high-velocity plot has been a big challenge. However, I feel really good about how it's come together in The Blinding Knife. After having established all the basics in The Black Prism, now the story really picks up and sprints. Just like with the Night Angel trilogy and its use of Ninja, you buck the "Sword and Sorcery" convention and introduce firearms into the mix. Is it a way of differentiating yourself from what has come before? Yes and no. The time period that I'm borrowing from in this book (which is a pseudo-Mediterranean at about 1600 A.D.) was an absolutely fascinating time in Earth history in terms of politics and scientific revolutions. I love studying big changes. Any huge change precipitates extreme reactions and puts people, both individually and corporately, under tremendous stress. Those stresses make for great conflict and great fiction. Obviously, gunpowder is one famous example of this. I focused on a time period where you could have the intimacy, if you will, of fighting with swords, you could have the tremendous disruption of the status quo of people fighting with firearms (diminished somewhat by the unreliability of the technology at this time), and you could have the wonder of magic all together. To me, that seemed like a really cool mix. The fact that I hadn't seen it done before just made it more interesting to me. I certainly hoped that if I thought it was cool, other people would think it was cool too! As I said before, it is a type of genre convention that you're going against, but it bloody well works! How do you make food better? Put cheese on it. How do you make stories cooler? Ninjas! Why hasn't anyone had the gall to do this before? Well, there are certainly good reasons not to do some of the things that I have done, but I like to take on new storytelling challenges with every story I write, and so I'm like a little kid that just picks up bunches of scissors and goes running around with them willy-nilly! It might not ultimately be a good idea, but so far I've had a lot of fun! Your novels have a rather English feeling about them, which is perhaps due to a smattering of sardonic wit. Which authors have been your inspiration? I think that the black humor that you see in my stories is in some ways the only kind of humor that fits the situations the characters find themselves in. Guys who are always fighting for their lives, as my characters usually are, tend to cast a bit of a jaundiced eye on life and death. So certainly I've been influenced by lots of British writers, but I don't think of myself as having a British sense of humor. I think perhaps the ultimate example of this kind of black humor is an American who wrote after, and fought in, the American Civil War, Ambrose Bierce. If you've never seen it, you should definitely look up The Devil's Dictionary, which has things like: "Love: A temporary insanity curable by marriage." But thank you! I'm glad you enjoy it. I think a bit of humor in a big story can make the highs higher and the lows lower, if only by contrast. Is there any news of the Night Angel or Lightbringer books making it to the silver screen? The movie rights have reverted to me from Cam Gigandet, who had them for 18 months, and I am working with some really amazing people right now to try to put together a package. But I don't want to name-drop yet and get fans too excited when honestly, the odds of this sort of thing are usually pretty low. And with a bit more maturity and time in the industry, I've seen how little power writers have once they say "yes." So I plan to be tremendously careful before I say yes again. You come from an academic background, do you think that this is a necessity to produce great stories? Not at all. In fact, I nearly dropped out of school at least twice. Once in high school, which would have been really bad. And once in college, which would have been only bad. I think every great writer is an autodidact. That is, if you want to write, you just have to have a really curious mind. You have to like learning for its own sake, and if you're one of those kind of people, it's quite possible to learn all you need to know by visiting the library and by talking with smart friends. The advantage a degree has is that you can take on massive piles of debt to subsidise yourself so that you have the time to be forced to read books that you should read, but probably don't have the discipline to. Also, the number of people interested in ideas per capita is probably higher in college than at your local bar. (Depending, of course, on the college in question... and the bar.) The truth is, with this part of writing, as with so many other things, an individual has to figure out what works for her. Your personality shapes what you need to be able to create. As do your life circumstances. What advice would you give to budding authors? Finish. There are some things you can only learn by finishing that story or that book. There are a hundred places to get stuck, either in talking to your friends about the great story you're going to write someday, in researching that great story you're going to write someday, or in writing the first page, or first chapter of that great story. You're going to write a story, and because you've read so many more great stories than you have written, your first work will not be a masterpiece. You can get stuck in a critical mode as soon as you realize that. And you can circle around, polishing that first page or first chapter and never finish the story. Finish it first, then fix it. Then sell it. Talk less, write more. Thanks you so much for your time. I can't wait to get my hands on the second volume! Thanks again go to Mr. Weeks for sparing the time to speak with me. I can't recommend his books highly enough, they are without a doubt the freshest take on the fantasy genre in recent years. It's always a pleasure to speak with someone who is a success in their field, is incredibly gifted while still being friendly AND unpretentious! Run out to your local bookstore and grab them now, I command it... please. Iceblaize 17 - I couldn't agree more - i'm just finishing up the final book of the night angel triology now . . . i'm blown away - these stories are unbelievably exciting/enthrallng/sad/happy/honourable!!! Words don't do justice to the world of Kylar & Co. I'm a convert and will stay!!! Looking foward to the new series also!! Great work Brent!! It took me a solid 100 pages to start getting into Prism, but now that I'm in it's pretty great. I think I just had to learn to let Kylar go. I was just so in love with the universe and the character that I kept looking for it in Prism, and they are very different books. Which ultimately, I think is a credit to Mr. Weeks' writing ability. In regards to a movie, Peter Jackson or Christopher Nolan would be the only directors I'd trust with a story so sweeping, so grand, and at the same time so intimate and personal. The visuals in my head were astounding, anything less than magnificent on the big screen would be a travesty. And honestly a trilogy like the Night Angel and follow-on movies whenever Weeks decides to write the books about the return of Jorsin would make their already huge careers legendary. And I really want to pick up the Black Prism books, but at the speed I devour good books I think I'd go crazy waiting for the next one. I'll wait until it's complete and buy the set in hardcover.